Political Climate Change | Vote! While we're plenty biased when it comes to our love for SLC and her inhabitants, we feel that part of what makes it so lovely is the different schools of thought attributed to each of us and the freedom we're afforded to follow them. So when it comes to matters of the political sort, we COLLECTIVELY like to err on the side of nonpartisanship. That being said, we do feel that there are a few non-negotiable sentiments that we as Americans--as human beings, really--should have no problem accepting and adopting: namely loving thy neighbor. There's been a lot of nasty news as of late, and we can't say we're crazy about the divisive language we're hearing, from Twitter to The Times. Whatever your affiliation, it seems the state of our union has been wildly polarizing this last year, and it's left our little nation more than a little tattered and torn. we think it's high time for some political climate change. Quite simply, our platform is putting aside all differences and focusing on loving one another, which is why we've no qualms at all about making it clear where we stand when it comes to a few hot political topics. Whether you lean red, blue, or anything in between, we can all agree that expecting the fair, decent, and humane treatment of our friends, fam, and neighbors is setting the bar reasonably low, right? Right. So we're putting our COLLECTIVE values on our sleeves (and totes). 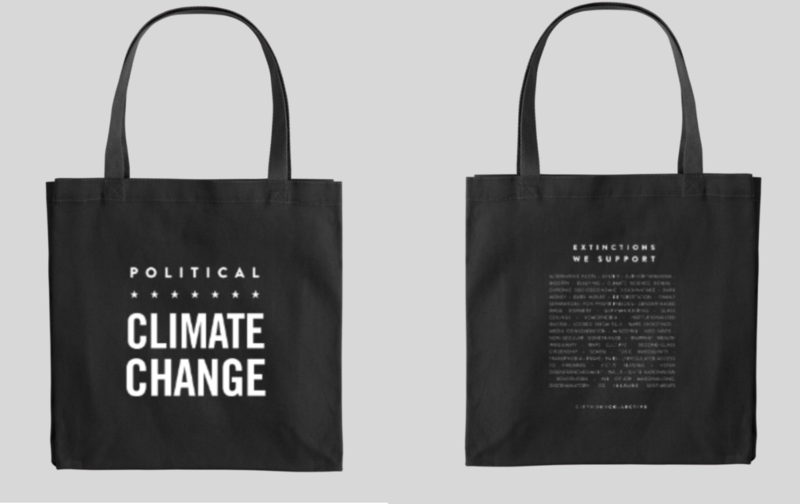 We've printed a very limited run of POLITICAL CLIMATE CHANGE shirts and totes, which bear a list of extinctions that we think everyone ought to be able to get on board with (racism? Xenophobia? Bigotry? Misogyny? Not so hard to condemn). Simply bring your mail-in ballot stub* or "I Voted" sticker to our office at 645 E. South Temple anytime between now and, well...when they're gone...and you'll get yourself a fantastic (and oh so practical!) way to show support for those of our fellow Americans that could do with a little supporting right now. And no, we won't tell you who to vote for, but we think people all across the political spectrum can agree that it's more crucial than ever to cast that ballot and make yourself heard. because the usa needs a little tlc. *Already tossed your stub? Just come on in with proof that you're registered--vote.org is a super easy resource.